RemoveIT is a free trojan, adware and spyware scanner that searches and destroys dangerous viruses, trojans and spyware. However, the effectiveness of RemoveIT is open to debate. The developers claim that it's so good, it "locates and removes many new dangerous files including spyware, malware, virus, worms, trojans and adware that other popular AV programs do not find." RemoveIT therefore is NOT a real-time scanner - it's based on cleaning-up after something has installed itself on your PC rather than real-time protection which I always think is a dangerous approach. There's nothing flashy about RemoveIT - the interface is based on Windows Explorer shell which also includes a slightly more advanced and expanded version of Windows Task Manager (to stop and block illegal processes) and the same with a Service Manager which gives you an overview of the services and program currently running on your PC. With RemoveIT's tools, you have more control over what runs on your PC both during startup and day-to-day operation. The Services Manager in RemoveIT is recommended for beginners as you can see clearly the actual names of the programs running while the Process Manager only shows those files that are running as parts of programs and as a result, you may shut something down that you didn't mean to. For a free and light malware scanner, RemoveIT is a solid program although it does not seem to detect anything that other scanners (such as Ad-Aware) can't so it's maybe not as effective as the developers claim. Locate and remove many malware files that other popular AV programs cannot find. RemoveIT Pro removes many viruses that other popular antivirus software cannot discover. It is an easy-to-use security software that allows you to protect your PC. 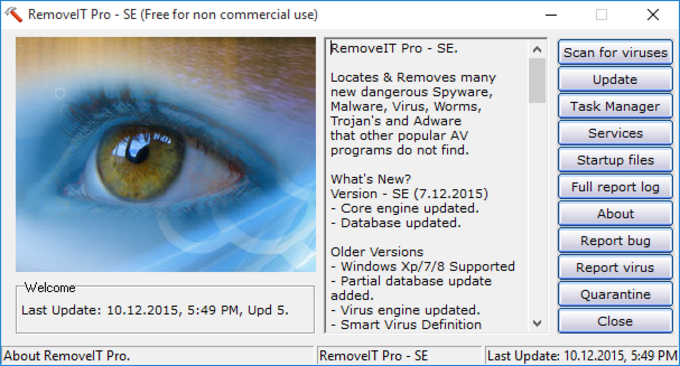 RemoveIt Pro detects malicious files and viruses that many other popular programs does not detect. It also offers you full report of active processes with full paths and full windows startup list of files that starts on windows startup. do a good detection job on many items but I still would not purchase it or use the free version. It's free and teaches you what not to do, like use this tool. Rogue program. This program is a total scam. It found 58 infected files on my clean system. VirusTotal verified that the files are clean. Do not use!!! What do you think about RemoveIT Pro? Do you recommend it? Why?